Window cleaning is an art that we have mastered over the years we have been serving our customers. However, what good is art if it cannot be seen. Being seen in this example relates to your window screens. A clean window is no good without a screen washing, therefore our window cleaning packages include screen washing. Window screen washing not only looks great, it reduces overall dirt and grime entering your home. There are 3 steps to screen washing and Sea of Glass makes sure we do not skip any. 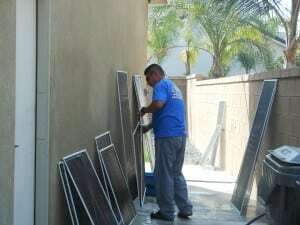 Screen washing is included in residential window cleaning packages and is no additional cost to the customer but that does not mean we do not take any shortcuts in screen washing.